I try to make this cake every Christmas season – from Martha Stewart’s 2003 Christmas Book. She calls it Birch de Noel, and I always thought it was fitting because up here in the North Country all the logs are generally covered with white in the winter. Of course, it’s divine, with the chocolate cake wrapped around a White Chocolate Mousse filling, all topped by sparkling billows of snowy white Seven Minute Frosting. Add in the Chocolate Meringue Mushrooms and Chocolate Truffles dusted in confectioner’s sugar and you have quite a centerpiece to your holiday dessert table. Martha Stewart suggests using rosemary sprigs dipped in sugar to decorate – do not do that, unless you like the taste of rosemary, which flavors everything it touches! The coconut is gorgeous on the cake, probably really there to mimic the bark of a birch, but really can easily be left off – it’s actually a bit of a detraction from the chocolate flavor and the textures. All the components, except the Seven Minute Frosting, can be made ahead, and really should be, so they have time to set. Seven Minute Frosting doesn’t hold up well more than a few hours. You’ll end up with a considerable amount of egg yolks, seven, so have a plan for them. Perhaps a pudding, custard, or ice-cream. You’ll have quite a bit of leftover coconut, too. I generally shave and toast it all and freeze for another use, later. So here’s the recipe, much easier than it looks, and with just a few minor changes! Seriously, it really is a doable dessert, especially with a stand mixer – the cake is very flexible and easy to roll. Happy Holidays, Merry Christmas and Happy New Years to all! Heat oven to 350 degrees. Wrap coconut in a kitchen towel, and place in oven for 20 minutes. Remove from oven, and place on a work surface. Reduce oven to 250 degrees. Tap coconut with a hammer until it cracks in several places; break it into pieces. The white flesh should be slightly pulling away from the hard shell. Separate it, keeping pieces of coconut as large as possible. Using a vegetable peeler, shave the largest pieces of coconut into long curls, and place on a baking sheet in oven. Bake for 15 to 20 minutes, until just dry. Grate the smaller pieces on the small holes of a box grater. You will need about 1/2 cup grated coconut for the cake filling. You will have extra coconut. Heat oven to 400 degrees. Line a 12-by-17-inch jellyroll pan with parchment paper, and set aside. Place egg whites in bowl of electric mixer fitted with the whisk attachment. Beat on medium speed until soft peaks form, 1 to 2 minutes. Increase speed to medium-high, and add sugar gradually, whipping until stiff peaks form. Transfer egg-white mixture to a large bowl. Using a rubber spatula, fold egg-yolk mixture into egg-white mixture. Sift cocoa powder and flour over top, and gently fold in. Pour batter into prepared pan, and smooth top with an offset spatula. Bake until cake springs back when touched, 9 to 10 minutes. Remove pan from oven, and immediately turn cake out onto a wire rack lined with parchment paper. Peel parchment paper from top of cake, and cool completely. (I don’t have a large enough rack, so I simply cool the cake on the parchment. Place a clean kitchen towel on work surface. Transfer cake on parchment paper to towel. Using a pastry brush, coat cake with rum. Using an offset spatula, spread white-chocolate mousse over cake. Sprinkle with 1/2 cup freshly grated coconut. With a long end of cake facing you, roll carefully into a roulade. Wrap in a kitchen towel, and secure with clothespins or large metal binder clips to hold the roll in a tight round shape. Place on a baking sheet, and refrigerate until firm, at least 2 hours. Remove from refrigerator, and unwrap. Using a serrated knife, trim the ends of the roll, cutting on the bias. Choose the more presentable end, and place it, cut-side up, on the log, forming a branch. If desired, use the other cut end for a second branch. Transfer the log to a serving platter. Slide 5-inch strips of parchment paper under the log to protect the tray while decorating. Coat with seven-minute frosting using an offset spatula. Remove parchment pieces. Decorate with meringue mushrooms, snowy chocolate truffles, and coconut shavings. Dissolve gelatin in 1/4 cup cold water, and set aside for 5 minutes. Place chocolate in the bowl of a food processor, and pulse until very finely chopped. Prepare an ice-water bath; set aside. Place 3/4 cup cream in a small saucepan, and bring just to a boil over medium-high heat. Add gelatin, and stir for 30 seconds to dissolve completely. Pour into food processor with the motor running, and process until chocolate mixture is smooth. Transfer to a medium bowl and place over ice water bath. Chill until mixture is thick enough to fall from a spoon in ribbons.Whip remaining 1 3/4 cups heavy cream to soft peaks. Fold into chocolate mixture. If not using immediately, refrigerate in an airtight container. In a small heavy saucepan, combine 3/4 cup sugar, the water, and corn syrup; cook, stirring occasionally, over medium heat, until sugar dissolves. Raise heat, and bring to a boil, washing down sides of pan with a pastry brush dipped in water to prevent crystals from forming. Continue cooking without stirring until a candy thermometer registers 230 degrees, about 5 minutes. Meanwhile, beat egg whites in the bowl of an electric mixer fitted with the whisk attachment on medium speed until soft peaks form, about 2 1/2 minutes. Gradually add remaining tablespoon sugar until combined. Once sugar syrup has reached 230 degrees, immediately remove from heat; with mixer on medium-low, carefully pour mixture into egg-white mixture in a steady stream down the sides of the bowl to prevent splattering. Increase speed to medium-high, and beat until mixture is completely cool and stiff peaks form, about 7 minutes. Add vanilla, and beat until fully incorporated. Frosting should be shiny and smooth. Use immediately. Heat oven to 200 degrees. Place Swiss Meringue in an 18-inch pastry bag fitted with a large round tip (Wilton #1A). Line two baking sheets with parchment. Pipe meringue, forming domes 1 to 2 inches in diameter. Pipe a stem shape for each dome. Place baking sheets in oven for 1 hour, reduce heat to 175 degrees, and continue baking until meringues are completely dry to the touch but not browned, 45 to 60 minutes. Fill a medium saucepan one-quarter full with water. Set over medium heat, and bring water to a simmer. Place bittersweet chocolate in a heat-proof bowl, and set over simmering water. Turn off heat; stir occasionally until completely melted. Using an offset spatula, spread bottoms of domed meringues with chocolate; let set at room temperature. Place white chocolate in a heat-proof bowl, and set over simmering water. Turn off heat; stir occasionally until completely melted. Allow to cool slightly. Spread white chocolate over dark chocolate; use a toothpick to create lines from the center of the cap to the edges. Let set in a cool, dry place. Poke a small hole in the center of each mushroom cap using a paring knife. Dip the pointed end of each of the mushroom stems in melted white chocolate, and insert into hole in center of cap. Allow to set. Meringue mushrooms should be kept in an airtight container in a cool, dry place. Very lightly dust the tops of the meringue mushrooms, with a fine sieve, with a little cocoa powder. Fill a medium saucepan one-quarter full with water. Set over medium heat, and bring water to a simmer. Combine the egg whites, sugar, and cream of tartar in the bowl of an electric mixer, and place over saucepan. Whisk constantly until sugar is dissolved and whites are warm to the touch, about 3 minutes. Rub the mixture between your fingers to test. Transfer bowl to mixer stand, and whip, starting on low speed and gradually increasing to high, until meringue is cool and stiff glossy peaks form, about 10 minutes. Add vanilla; mix until combined. Use immediately. I’ll be taking this Buche de Noel by to the Fiesta Friday 100 anniversary extravaganza, and I’m also co-hosting this event, so a big shout out to Angie from the Novice Gardener and Fiesta Friday for putting the event on and Steffi from Ginger&Bread, Suzanne from APugintheKitchen and Judi from CookingwithAuntJuju for co-hosting, too. Stop by, say hi, visit and mingle and I hope to “see” you there! Of course, I’ll also be posting to Throwback Thursday, a link party co-hosted by Moi!! Yes, that’s me, yours truly! And Alli, Quinn & Meaghan – you’ll see all their links on Throwback Thursday! This entry was posted in Click here for Fabulous Food Posts and tagged Cake, Chocolate, Desserts, Frugal Hausfrau, Martha Stewart, Special Occasion, white chocolate. Bookmark the permalink. Your yule log is absolutely beautiful! What a stunning presentation, Mollie! What a lovely cake–it’s so striking, especially as a birch do noel! The fluffy icing and toasted coconut shavings are a perfect visual touch and oh gosh the sound of that white chocolate mousse too!! Thanks, and it was just as good as it looks! I wish you could have seen it in person!! This looks absolutely amazing, Mollie! Now I am wondering why I thought of using ice cream … I mean, seriously? Thanks so much for co-hosting with us this fortnight, it’s one amazing party! thanks, Ginger! Your ice-cream cake looks and sounds amazing!! I don’t know anyone who doesn’t love ice-cream! It’s going to be a fun party, so everyone, please join in! I couldn’t ask for better co-hosts, and happy new year’s to you, too! Lol, Jhuls! And thank you! It’s an indulgence, but it so good and so over the top! Perfect for a Holiday. The thought of this will hold me over when I’m eating the many salads in my near future!! I think it’s that it is a bit unexpected that makes it really stand out. Not that I don’t like the reverse with Chocolate Frosting, too! haha! OH MY, there it is, so beautifully done. Wow!! 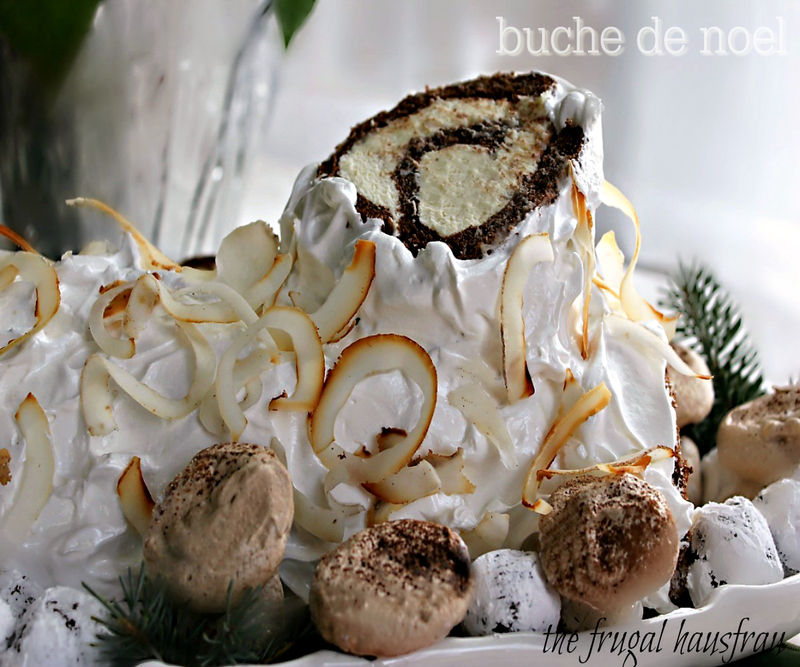 Gorgeous Buche De Noel!! wow this is very impressive and wonderful and I think you have done a great job. I am very impressed…love the coconut flakes. Happy New Year. Thanks so much Teresa! We had so much fun putting it together, the whole family pitched in to roll truffles, frost, decorate and take pics! But the most fun was eating it!!! The coconut is really superfluous, but it just makes the cake so visually stunning!! And happy New Year’s to you, too! !